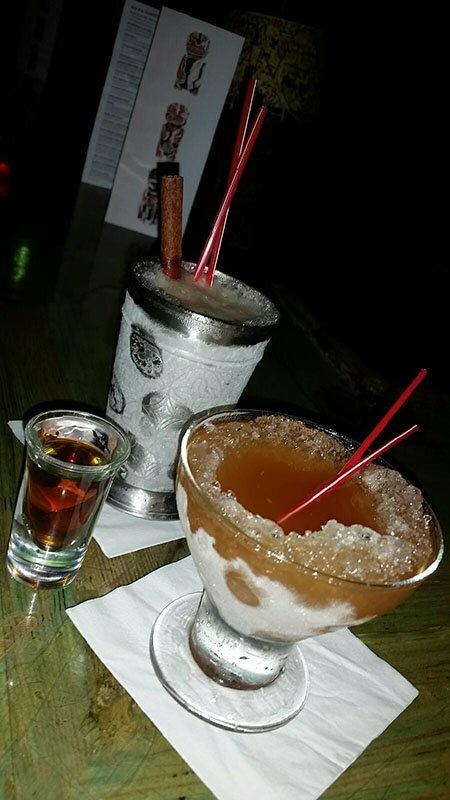 Tiki and bingo: Two things that go great together. The South Florida chapter of the Fraternal Order of Moai has proven that to be true over the past five years with a popular and ongoing series of monthly charity events at The Mai-Kai. The non-profit Tiki fraternal group kicks off its 2019 season tonight. 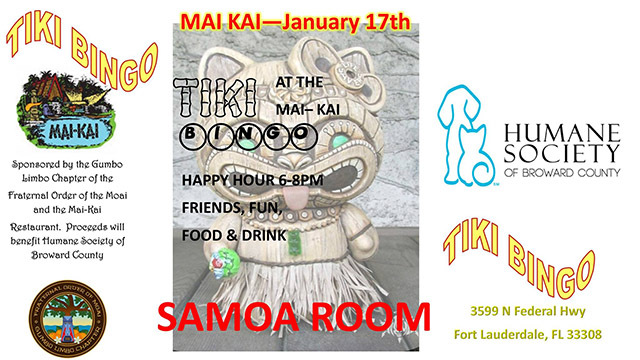 Jan. 17 – Tiki Bingo at The Mai-Kai in Fort Lauderdale hosted by the Gumbo Limbo Chapter of the Fraternal Order Of Moai. 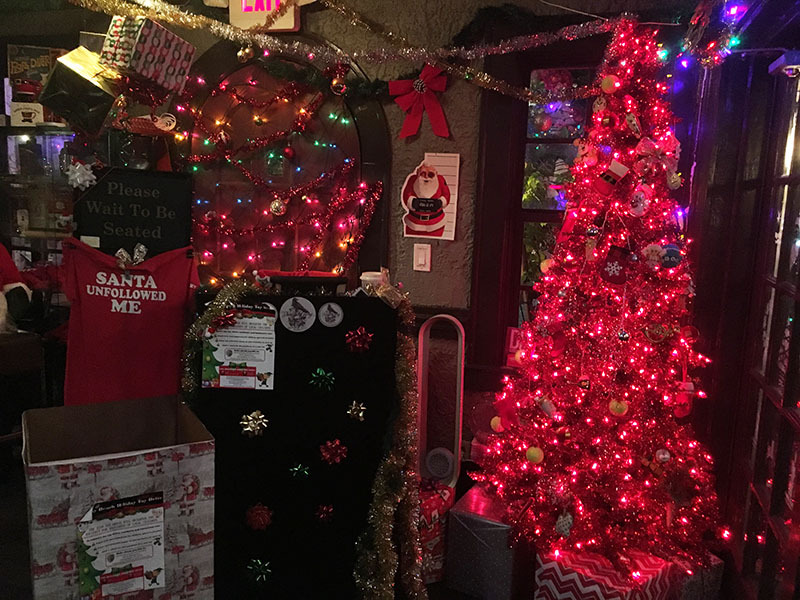 A fund-raising event featuring an extended happy hour. The Fraternal Order of Moai (aka the FOM) has long been a proponent of fun social events that also raise money for its favorite charities. While the annual Ohana: Luau At The Lake in Lake George, N.Y., is the group’s major flagship event, the nine active chapters across the country also hold regular, more intimate gatherings for the general public as well as members. One such event is Tiki Bingo at The Mai-Kai, which will celebrate its fifth anniversary in May. 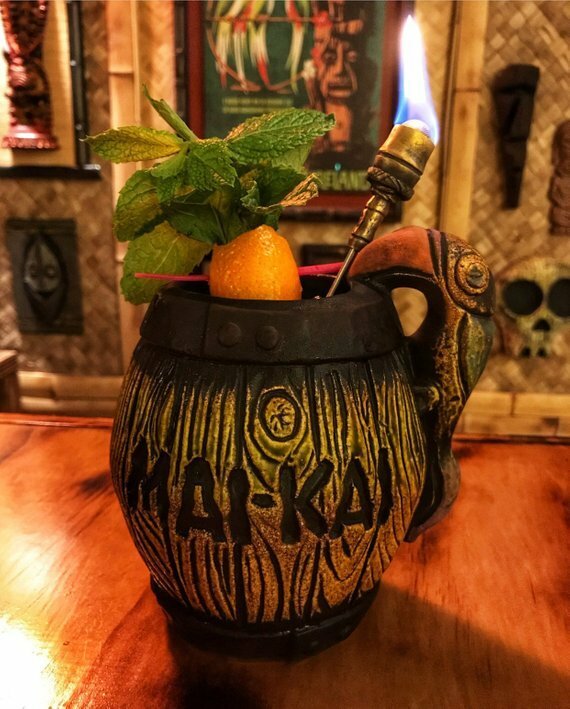 Held nearly every month on a Thursday in one of The Mai-Kai’s most historic and secluded dining rooms, Tiki Bingo gives locals a chance to socialize and have a good time while raising a few bucks for those in need. The Samoa Room was part of the restaurant’s original structure built in 1956 and most famously contains shadowboxes featuring what are reported to be actual shrunken heads from the South Pacific. It seats around 50 people and is the perfect spot for a small group. Mahalo to everyone who turned out to our talk on Lemon Hart and Demerara rum, plus all the festivities at The Mai-Kai Takeover from the Magical Tiki Meet-Up and Retro Rekindled. The rum raffle raised $275 for the Humane Society of Broward County. 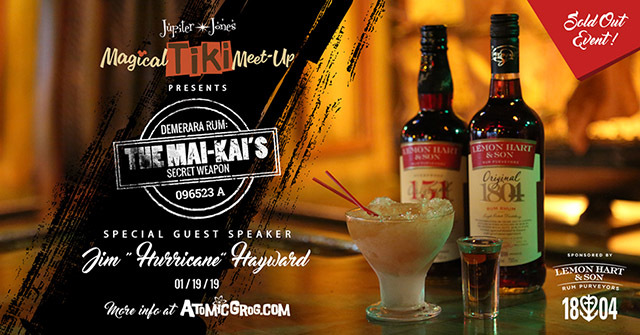 The Atomic Grog is joining forces with the Magical Tiki Meet-Up and Retro Rekindled for a special talk at The Mai-Kai on Saturday, Jan. 19: “Demerara Rum – The Mai-Kai’s Secret Weapon.” This event is sold out! 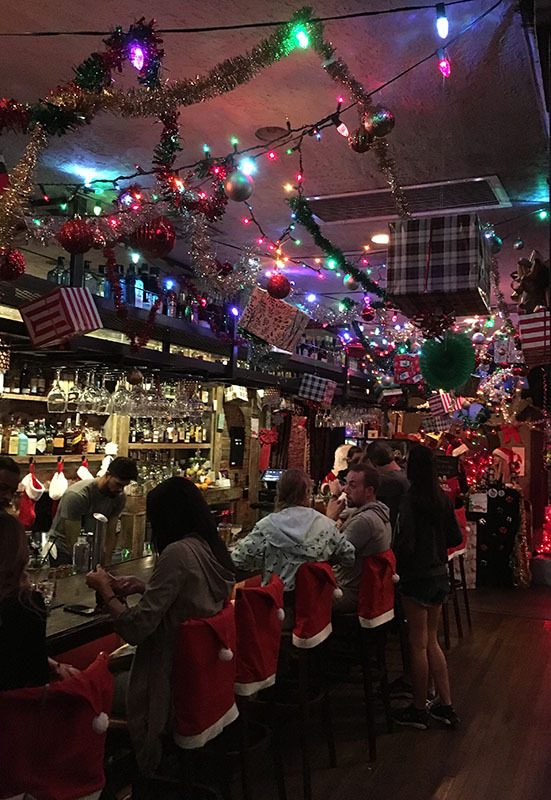 4 p.m. – Early entry for happy hour in The Molokai bar. Meet and greet, Demerara rum discussion and cocktails. 5 p.m. – Seating for dinner. * Advance dinner show tickets include early entry and sample cocktails. Happy hour tickets were also offered separately. Attendees will enjoy two sample cocktails featuring sponsor Lemon Hart & Son rum, there will be a raffle to win a bottle of rum, plus an assortment of free goodies. Everyone who bought tickets or RSVP’d will have their names listed at the door. Early entry and the sample drinks are included for those who signed up for dinner. For those attending happy hour only, there will be a $15 charge for the Demerara rum drinks, which will include a “lost cocktail” from the 1956 menu that is rarely served. * What is Demerara Rum? * The History of Demerara Rum and Lemon Hart. * Tiki arrives with Don the Beachcomber. 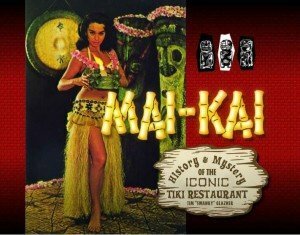 * The Mai-Kai, Mariano Licudine and mid-century Tiki. * Mixology magic: Demerara Rum’s greatest hits. * Lemon Hart at The Mai-Kai: Yesterday and today. Brand ambassador Miles Maximillian Vrahimis will also be on hand to answer questions. 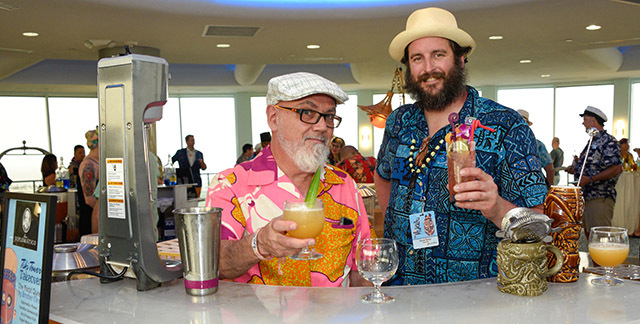 As promised, news and updates on The Hukilau 2019 are flowing like rum from a barrel as villagers gear up for Feb. 1, when tickets and hotel rooms will go on sale for the 18th annual Tiki weekender in Fort Lauderdale. The Hukilau 2019 official artwork by Baï, an artist based in Paris. 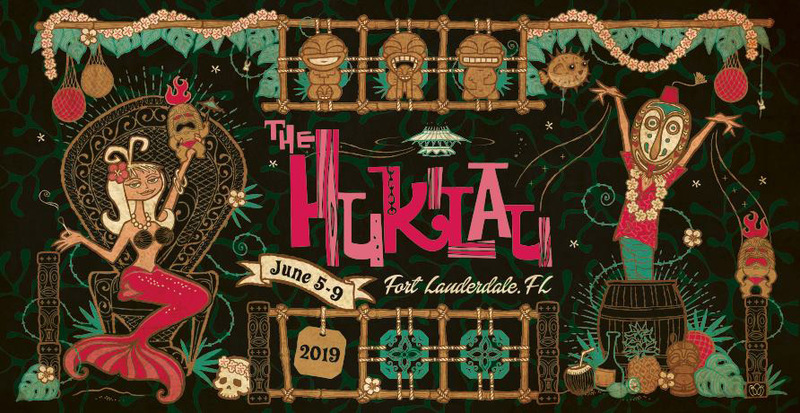 The Hukilau: June 5-9, 2019, at the Pier Sixty-Six Hotel & Marina and The Mai-Kai restaurant in Fort Lauderdale. Hotel room parties return: It’s been quite a while since The Hukilau’s guests, known affectionately as “villagers,” have been able to throw their own official full-blown room parties at the host hotel. It was 2010, in fact, when we last enjoyed an official “crawl,” back when The Hukilau was at the Bahia Cabana and special guest artist Shag served as one of the room party judges. There’s now a pent-up demand for such parties, but they have unfortunately long been a logistical challenge. In 2019, however, The Hukilau organizers have risen up to meet that challenge. There will be 10 room parties approved by Pier 66 and sanctioned by The Hukilau, we’re told. They will be held on one night only: Thursday, June 6, following the signature Tiki Tower Takeover. Organizers will begin accepting proposals for themed rooms starting next Monday, Jan. 21, and ending on Feb. 8. 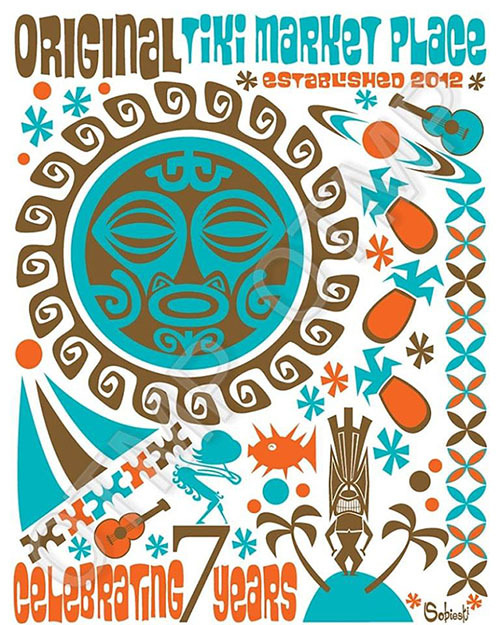 Flashback: During The Hukilau 2010 room crawl, the artist Shag visits Robotiki’s Planet of Forbidden Tiki while The Disasternauts perform in the Go11 Spaceport at the Bahia Cabana on Fort Lauderdale Beach (RIP). Click photo for a recap and gallery. “This is a great opportunity for villagers to get more involved and help create and shape part of The Hukilau experience,” said Richard Oneslager, the event’s owner and head organizer. He explained that applicants will be selected with an eye toward creating a broad mix of styles and unique experiences. In other words, if you want your party proposal to be picked, be creative. 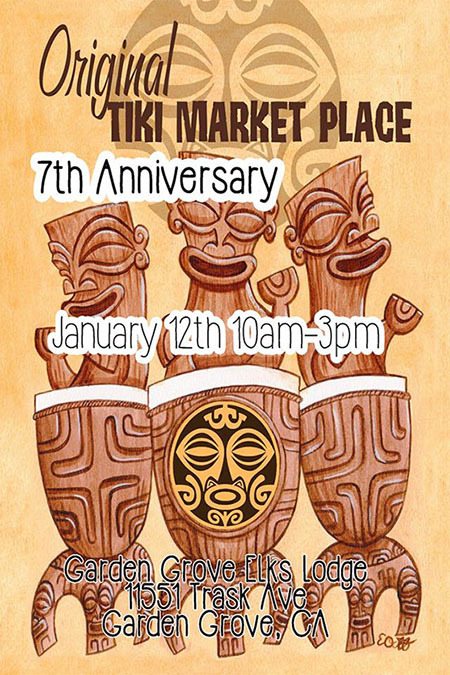 Jan. 12 – The Original Tiki Market Place 7th Anniversary in Garden Grove, Calif. At the Garden Grove Elks Lodge, conveniently located just 2.5 miles south of Disneyland and Trader Sam’s Enchanted Tiki Bar. 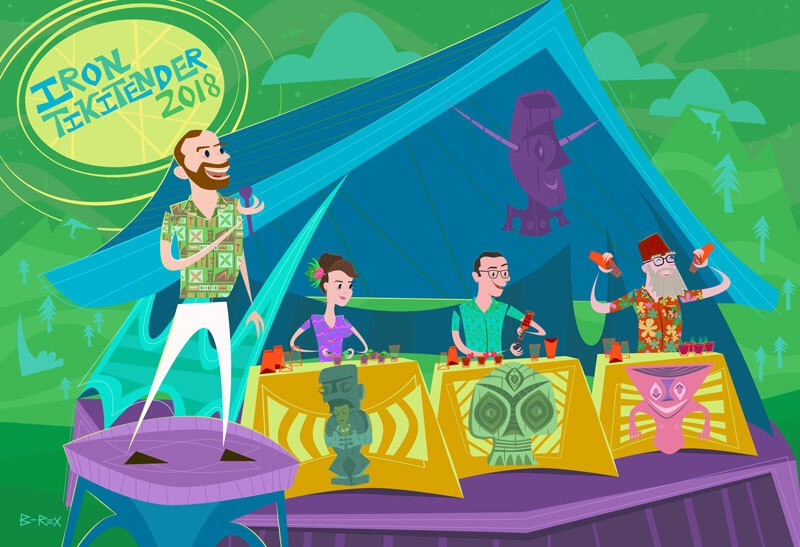 Featuring Tiki vendors, live Hawaiian entertainment, cocktails, food, and more. Hours: 10 a.m. to 3 p.m. Cost: $10 (cash only; includes a drink voucher). 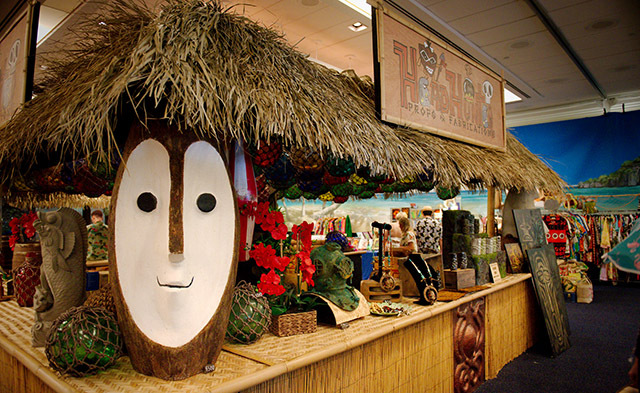 Launched in 2012 at the now-closed Don the Beachcomber in Huntington Beach, the Original Tiki Market Place was conceived as a tribute to Don and the original International Tiki Market Place in Waikiki. Held seasonally, it quickly became a favorite spot to buy and sell vintage wares in Southern California, attracting the top artisans from the area. * Free high-quality art print (11-by-14) by Clee Sobieski (see above) to the first 70 paid guests. After those run out, there will be more available for $10. During a recent visit to Epcot at Walt Disney World, we made sure to visit the new exhibition celebrating American Indian art. The American Heritage Gallery always does a great job with its exhibits, featuring multimedia and interactive displays plus plenty of artifacts and poignant narratives in the relatively small space. The previous exhibit on African-American history and culture was a must-see. The exhibit, “Creating Tradition: Innovation and Change in American Indian Art,” opened in July at the American Heritage Gallery inside the American Adventure Pavilion in World Showcase. It’s a collaboration between Disney Imagineering; the Smithsonian’s National Museum of the American Indian in Washington, D.C.; and the Museum of Indian Arts and Culture in Santa Fe, New Mexico. All of the artwork comes from the collections of those two museums. 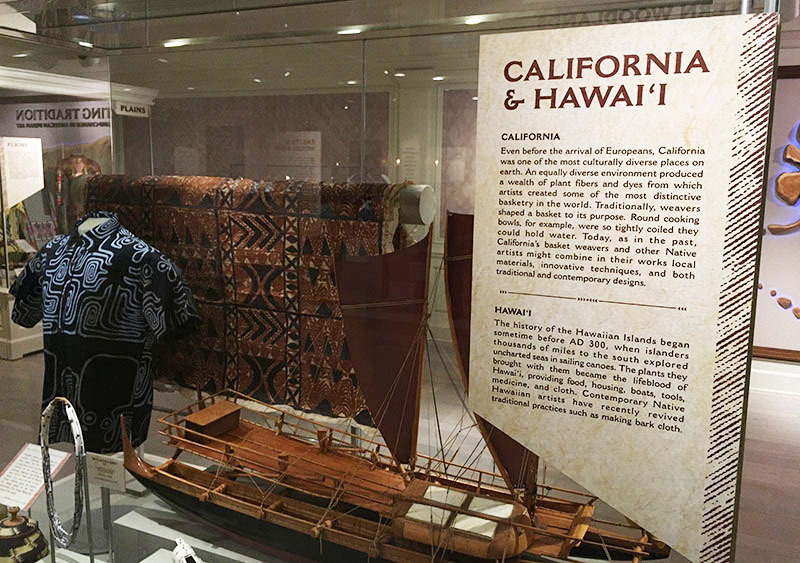 Included among the 89 pieces representing 40 different American Indian tribes is a prominent display dedicated to California and the islands of Hawaii. 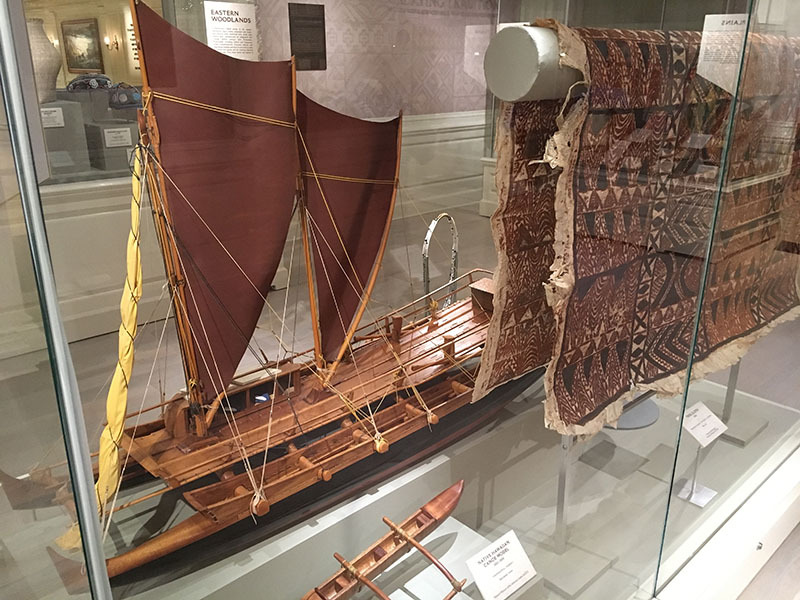 It includes models of a canoe and a sailboat based on those used by Polynesian seafarers who settled the Hawaiian islands more than 1,700 years ago. 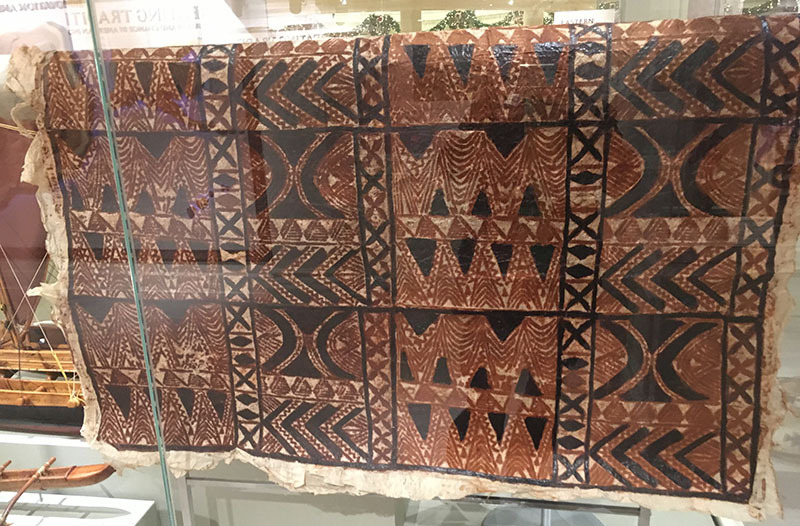 There’s also a huge piece of Polynesian tapa cloth, circa 1900s. Of interest to more modern tastes is the hand-printed He’e Aloha Shirt crafted by native Hawaiian Craig Neff of The Hawaiian Force. You can find his store in downtown Hilo, Hawaii. Native communities from six other geographic regions across the United States are included. Members of the Seminole Tribe of Florida performed at the exhibit’s opening. The goal of the exhibition is to showcase authentic, historical artifacts alongside contemporary works of American Indian art. Guests learn how cultural traditions have been handed down through generations via interactive displays with narration and insights by some of the artists with works on display. Objects from the 1800s are displayed alongside those created within the past year as a way to show the complete arc and look toward the future of American Indian art. Many of the contemporary pieces have never been on display, according to the Smithsonian magazine for the National Museum of the American Indian. The three interactive video exhibits feature displays that resemble a campfire. When guests wave their hands in front of the flames, the displays turn into video presentations. The music heard throughout the gallery was recorded by Native musicians from the regions showcased in the exhibition. Among the featured artists are fashion designer Loren Aragon (Acoma Pueblo), doll-maker Glenda McKay (Ingalik-Athabascan) and Juanita Growing Thunder (Assiniboine Sioux). The must-have Tiki bar accessory of 2018 may have been the custom swizzle sticks designed and made by California artist Michael Grider that take flaming cocktails to a new level. It didn’t take long for these inventive items, priced at $25 each, to sell out on Etsy. Grider’s Torch Swizzle also requires a specially formulated lemon extract “Torch Juice” developed by Grider. Buy four and you got a free Torch Juice Kit. But if you’re a procrastinator like me, you missed the boat when these first hit the Internet and took off like wildfire. The last batch was shipped in November. These are not mass produced, but hand-sculpted by Grider and then created using a centrifuge and a mold filled with hot metal. After the top is cast around a stainless steel rod, it’s hand-sanded and polished before it’s sent to be plated and receive a copper, nickel, or brass finish. Grider then completes each swizzle with patina, polish and a coat of clear enamel. I hate to clue more people into this, but what the hell: A limited amount of torch swizzles will be up for grabs on Thursday, Jan. 10, at 6 p.m. (Pacific time). Grider and his wife Karissa promise that a few torches will go online for pre-order. They won’t be available again for a few months due to Michael’s upcoming surgery, so now’s your chance to snag one at the same $25 price tag, plus $15 for the juice kit. The kit includes Torch Juice in a reusable dropper bottle for easy dispensing, two replacement wicks, and four replacement screens. The free kit offers stands if you’re able to snag four torches. During my recent holiday binge journey through all the cocktails on the Miracle pop-up bar menu, I was inspired to play around with various seasonal recipes in my home bar. I tried several formats, but I was most smitten by the concept of the flip. Traditionally, a flip is a cocktail containing egg, sugar and a spirit. They’re similar to egg nogs but without milk or cream. Originally served hot, flips are now usually shaken with ice and strained into a chilled coupe or wine glass and dusted with nutmeg, according to Difford’s Guide. The first flips can be traced back to England in the late 1600s. Back in 2015, I created the Demerara Flip for the holidays and was pleased with the results. At Miracle, the delicious Gingerbread Flip was reminiscent. It was a shaken drink featured bourbon, gingerbread syrup, Elemakule Tiki Bitters and a whole egg. It was served in a coupe with a dusting of nutmeg. I understand that the use of a whole egg can put some guests off, hence the drink’s transformation into the Gingerbread Old Fashioned at Death Or Glory’s two Miracle bars that I frequented. I’m not opposed to eggs in cocktails, but I decided to drop the yolk and keep the white, which is much more common in modern recipes. So the Secret Santa is not strictly a flip, but it has all the same hallmarks. The use of the rich mixes makes up for the missing yolk, and the unpasteurized white adds that traditional foamy head and texture while not imparting any flavor. If cracking an egg to extract the white makes you squeamish, you can find pasteurized egg whites in a carton in most groceries. The Gardenia Mix was designed as a one-stop-shop for one of Don the Beachcomber’s most complicated (and messy) mixes (aka Pearl Diver’s mix and Coffee Grog batter). It replaces the butter with coconut, but includes the key honey, cinnamon and allspice flavors. I sought a bit more rich honey and allspice notes, so I also used Reynolds’ new Orange Blossom Honey Mix and his now-retired Tiki Spices (another old Donn Beach ingredient featuring allspice and vanilla, aka Don’s Spices #2). I posted the recipe on the BG Reynolds’ Tiki Bar group on Facebook, where members discuss the products and share classic and new recipes. 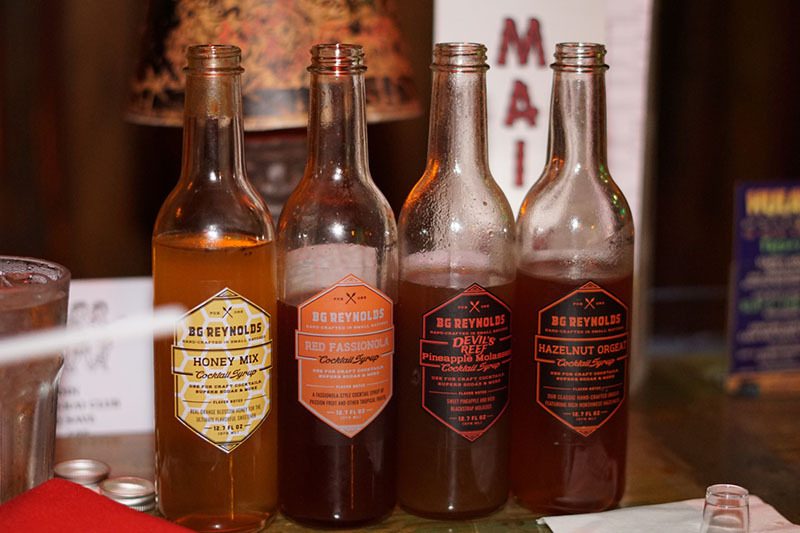 The Secret Santa Flip is very flexible, however, and you can make your own honey and Don’s Spices #2 (or simply use allspice dram) if those bottles aren’t in your arsenal. There’s also an alternate version that uses homemade Pearl Diver’s mix in place of all three bottles. The butter gives it a slightly different flavor, but it’s perfectly in keeping with the holiday spirit (think Hot Buttered Rum). 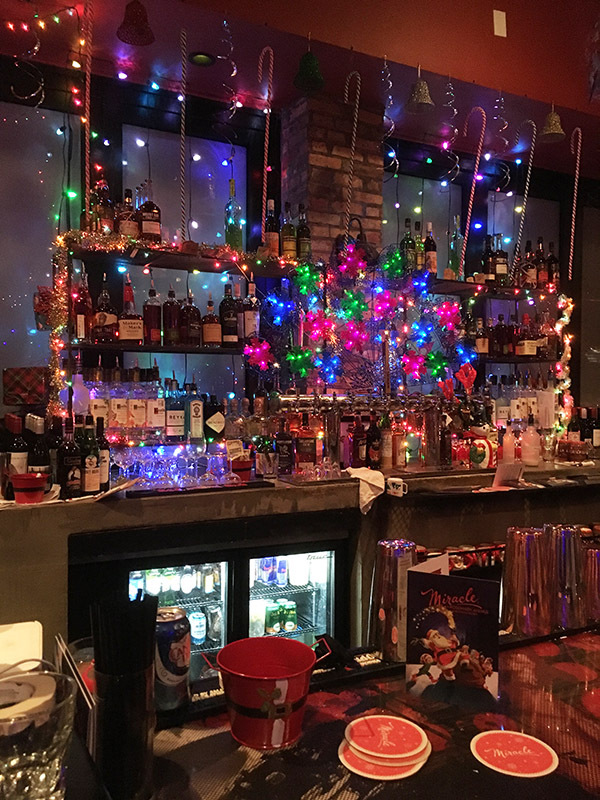 While visions of sugar plum cocktails are still dancing in my head (and on my taste buds), I would be remiss if I didn’t share my deep thoughts on the Miracle pop-up bar menu that recently dazzled imbibers at more than 80 locations around the world. Florida was lucky enough to have nine Miracle bars, the most of any state, for the pop-up’s 39-day run from Black Friday through New Year’s Eve. I’m fortunate enough to work near the site of the dedicated West Palm Beach location and live not far from Death Or Glory, the Delray Beach craft cocktail haven that spearheaded Miracle’s entrée into South Florida. I got a brief taste of the inventive concept in 2017, the first year of Miracle on Delray Beach. 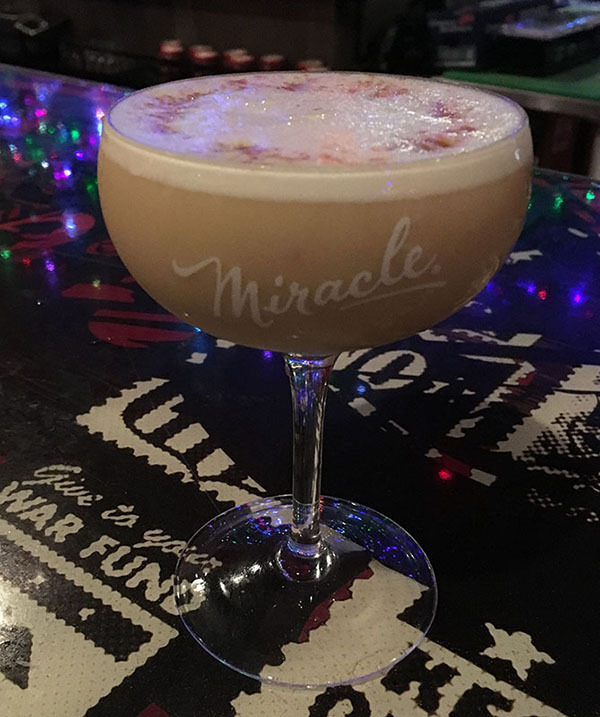 But it was enough to get me as excited as a kid waiting up for Santa when it was announced that the award-winning bar would launch a second location, Miracle on Rosemary, in a vacant space in downtown West Palm’s bustling CityPlace shopping and dining district. In the weeks that followed, I made regular stops at both locations to unwind from the hectic holiday hubbub. But more importantly, I was on a mission to sample everything on the cocktail menu along with some of Steel’s decadent dishes. The results are detailed below. As with all of my cocktail adventures, I couldn’t resist the urge to rate the drinks on my own 1-5 scale. If you follow me on Instagram, you’ll know I also took plenty of photos that I’ll also share here. Perhaps it was simply a holiday miracle, but it appears in hindsight that Boehm omnipotently foresaw the coming confluence of craft cocktails and Christmas. The average American consumes double the amount of alcoholic drinks over the holidays than any other time of year, according to research. Now, some of us have many more craft options than the standard eggnog and coquito. At Miracle, with the Christmas spirit flowing freely, cocktail newbies are more likely to dip in their toes, or just dive in headfirst. “We kind of trick them into drinking cocktails,” Boehm has been quoted as saying. Or course, this interest has been building for years on both fronts. But while major metro areas have long become accustomed to having outstanding craft bars in every neighborhood, great swaths of the U.S. (and many countries overseas) are still in the cocktail dark ages. Enter Miracle, which has blown up as a contagious concept, adding some 30 locations last year alone. There’s no reason to believe it won’t top 100 in 2019. 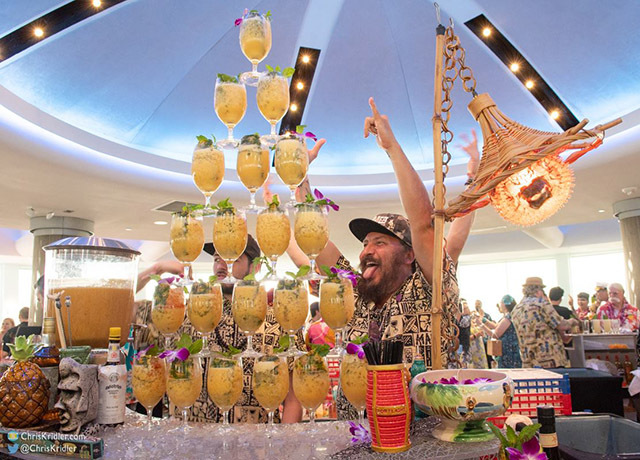 Organizers made the first official announcement of 2019 on New Years’ Day, promising the return of all the hallmarks that make the event one of the Tiki revival’s top summer destinations. Tickets and hotel rooms will not go on sale until Feb. 1, but more details are due to be released throughout the month. It will be the fifth straight year that The Hukilau has pitched its tent at Pier 66, and the 17th year at the legendary Mai-Kai. (The Hukilau launched in 2002 in Atlanta before migrating south to Florida the next year.) Below you’ll find all the news from the initial communiqué, embellished with some of our favorite photos from last year’s festivities to whet your appetite. Stay tuned for future updates on The Atomic Grog. June 5-9 at Pier 66 Hotel & Marina and The Mai-Kai, Fort Lauderdale. Tickets and hotel rooms go on sale Feb. 1. Look for more details throughout January.